Taoiseach Enda Kenny is trying to stall the Fine Gael leadership race until he can deal with the "immediate priorities" of Northern Ireland and Brexit. In a performance that will spread fear among backbenchers, the Taoiseach indicated he will not be making a prompt statement on his resignation when he returns from America - and he wants to cling to power for months. Speaking in New York, Mr Kenny rejected questions on his plans, saying: "I'm not going to answer that for you. "I'll deal with my own parliamentary party. I spoke to them before I came to New York, I'm telling you now I have a number of immediate priorities on my desk when I arrive back tomorrow morning...and I intend to get started on those." Sources close to both the leadership frontrunners, Leo Varadkar and Simon Coveney, were last night surprised by the statement. "Good luck to him. That won't wash with the party," said one source. Several backbench TDs indicated last month that they would be prepared to table a motion of no confidence in Mr Kenny if he does not set a definitive date for stepping down. It is accepted within party circles that Mr Kenny should attend an EU Council meeting in April to deal with the initial fallout from British Prime Minister Theresa May's triggering of Article 50. 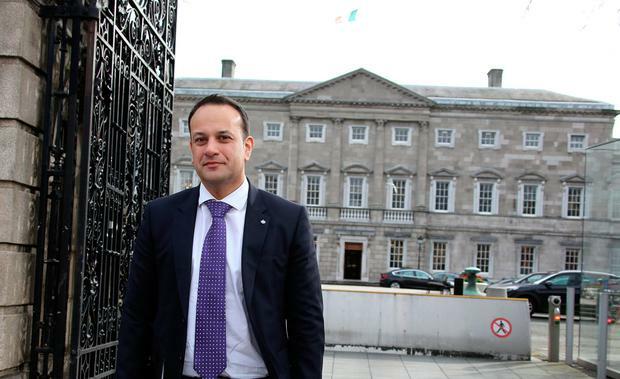 However, the Taoiseach has now also attached himself to the result of the Northern Ireland elections. "I have to deal with a number of priorities here. The first priority is to form an Executive in Northern Ireland. We have no devolved authority in Northern Ireland now," Mr Kenny said. Mr Kenny said it is "fundamentally important in terms of Brexit" that a new government is formed. Mr Kenny also defended inviting US President Donald Trump to visit Ireland. He said: "It's a normal courtesy in our country that if you receive an invitation from somebody, you return that invitation at another time." Meanwhile, a group of Irish and US artists and activists last night held a major rally and concert for civil rights in opposition to the invitation. The 'Irish Stand' initiative in New York was supported by high-profile figures on both sides of the Atlantic including Rosie O'Donnell, Liam Neeson, Hozier and Gabriel Byrne.